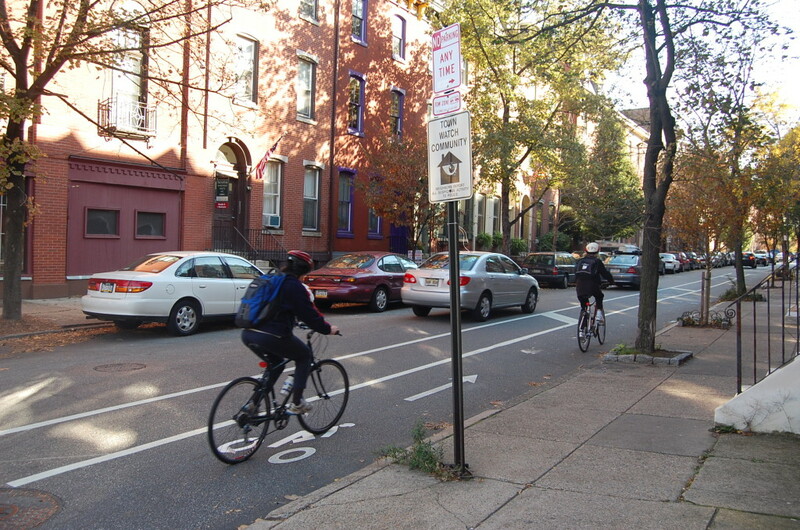 Earlier this year, Philadelphia was awarded a federal grant to install protected bike lanes on numerous corridors and streets throughout the city. The plans and designs of those protected lanes are not complete, but some community organizations have begun speaking about what safe, physically-separated bike lanes may mean for their neighborhoods, and the cyclists who both live there and commute and ride through there. Tomorrow evening, the Zoning Committee of the Wash West Civic Association is holding its monthly meeting and on the agenda is the topic of “delineated bike lanes.” Two of the lanes that Philadelphia received money to install are proposed for Spruce and Pine Streets in Center City. The Zoning Committee meeting is a first step at initiating a conversation about these types of lanes, and meant for West Washington Civic Association residents. While someone from the Office of Transportation and Infrastructure Systems will be present at the meeting, there will not be a formal presentation from the city about protected bike lanes. Tuesday’s zoning committee meeting is meant to begin the conversation on safe, protected lanes on those well-used bike lanes in Philadelphia. WWCA’s monthly board meeting, on December 13, is when the city will present on protected bike lanes. The Bicycle Coalition has not yet received a briefing from the City on its plans for conducting community outreach regarding upgrading and creating protected bike lanes throughout the City. When we do, we will inform our members and supporters. The Wash West Civic Assn. Board Meeting on December 13th at 7pm will take place at the Bluemle Life Sciences Building on Jefferson’s Campus, 233 South 10th Street, Room 105/107. Tuesday’s (11/22) zoning committee meeting is at 7pm at the same location.